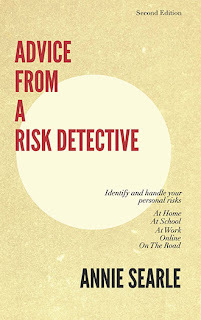 Advice From A Risk Detective: The hardest part is done. This morning I had the pleasure of shipping off the manuscript to Molly Martin, who will do the final edit with suggestions for the book. Lauren and I put long hours in to get the manuscript to this point, and we're grateful Molly could fit this job in. She's a strong writer and editor, and has a good sense of my voice from the work that she did on the ASA website. It's good to be working with her again. When the manuscript comes back, we turn around and send it in its Word layout to the seven back-of-the-book blurb writers to read and determine if they actually want to say something. At the same time, the manuscript goes to the book designer, who can begin on design of the interior while waiting for the blurbs. He is currently working on the design of the cover. Once Jesse Brown, the designer, is done and has put it in PDF format, I ship it to Amazon's CreateSpace publishing division, and then sit back and wait for a proof. Since it's not being printed on a Gutenberg press like the one in the illustration, we're almost there and the end is in sight. All the rest of the work here is collaborative, a pleasure. The hardest work is over.